Freed Developments is coming to St Lawrence Market. Mostly known for its strong presence in King West, Freed Developments is venturing east of Yonge Street to 60 Colborne St. 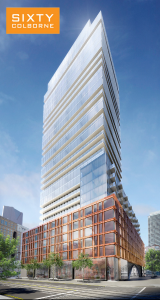 In the red hot St Lawrence Market neighbourhood, Sixty Colborne will be a 25 storey tower (with 281 suites) located at the south west corner of Church Street and King Street East. Sixty Colborne will be designed by Peter Clewes of Architects Alliance, one of Canada’s most adventurous architects, and responsible for some of the most innovative residential buildings in North America. The interior will be designed by Johnson Chou, behind several high-end projects in Toronto. Sixty Colborne will be a LEED certified building. Suites will have custom designed kitchens, with 9′ ceilings, floor-to-ceiling windows, Corian countertops, digitally controlled HVAC systems, engineered hardwood flooring, glass showers and chrome fixtures. Suites will range in size from a 400 sq ft bachelor, to over 1400 sq ft 3 bedroom units, with an optional den and balcony. Prices are starting just under $300,000. Enjoy urban living, convenience, exceptional style, culture, and luxury just steps away from everything St Lawrence Market and downtown Toronto has to offer. >>CLICK HERE TO TAKE A TOUR OF SIXTY COLBORNE AND SEE HOW THE NEWEST PROPERTY BY FREED DEVELOPMENTS IS ELEVATED FROM THE ORDINARY. BOOK AN APPOINTMENT WITH ME BEFORE THEY OPEN TO THE PUBLIC ON APRIL 14th. >>Click here to contact me, if you are interested in this project or any other Toronto condo or loft development.